Jimmy and Jey Uso enjoyed a remarkable 2017 as they staked a legitimate claim to be the best tag team in the world. The WWE SmackDown Champions have been on a roll ever since ditching their face paint and babyface routine in the autumn of 2016. Recast as cocky street thugs, from June onwards last year the twin brothers repeatedly stole the show at pay-per-views in an epic feud with The New Day. The classic rivalry grew from a promising start at Money in the Bank and Battleground to a match-of-the-year contender on the SummerSlam pre-show. And by the time it ended in a stunning Hell in a Cell match in October, the Samoan duo reverted to faces due to the undeniable adoration of the crowd. They will defend their titles against The New Day again at Fastlane on March 11, in a match which could also feature Shelton Benjamin and Chad Gable. 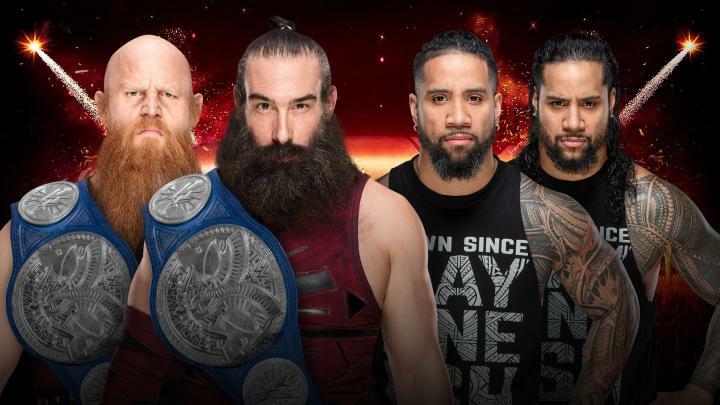 Whether they make it to Wrestlemania 34 as champions remains to be seen, but they deserve a place on the show’s main card for the first time in their careers. If they do, Jimmy (real name Jonathan Fatu) and Jey (Joshua Fatu) could even one day surpass the legacy left by their father, WWE Hall of Famer Rikishi (Solofa Fatu). Jimmy, 32, from San Francisco, California, invited the Mirror to The Uso Penitentiary and talked about the roots of their acclaimed run on SmackDown LIVE. 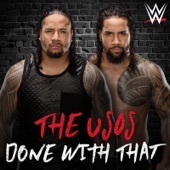 Lots has been said about the reinvention of the Usos, a transformation that began in late 2016. It feels like you’ve perfected the entire package – your look, theme music, ring work and promos. It’s all come together. How much input do you have in that process, like adopting new ring gear or selecting a new entrance song? That’s all us. I mean it, when you see this whole reinvention, that is every bit of me and my brother. It’s so funny because the ring work has never changed. That’s always been there. Our gear, literally, we wear that outside of the ring. That’s how I dress. Even with the baseball cap, I’m always having a cap on. And I just felt it was me to wear a cap out there. It’s little stuff like that to make us, us. That’s what that was. That’s how people found out we were real and they followed that and they could adapt to that. Everything is us, from the gear to the black and white, baseball caps to the shoes – I wore those same shoes I do when I’m wrestling – I wore them at high school. I wore those same shoes in high school. So when I’m telling you that’s the Usos, that’s the Usos. As far as our ring music, we was dying to go and hop on that track. We heard John Cena on his entrance music, I remember The Rock being on his entrance music, I just thought that was really cool and added a whole lot more personality to them, personally. So what you see out there, that’s 100% The Usos. I think people can feel that, definitely. Talking about your promos, on the February 6 edition of SmackDown we saw one of the best of your career, spelling out how 2017 was a pivotal year for The Usos and talking about what lies ahead in 2018. You both seem more comfortable on the microphone – what would you put that down to? If you ever noticed through my whole career, since I’ve been here, we never, ever talked on the microphone. If you go back and watch the feuds with Roman [Reigns] and Dean [Ambrose], the babyface Usos with the paint, we never talked. And to me it was… mind boggling. I was always asking. We knew to be successful in this business, you got to do your thing inside the ring and you got to do your thing on the microphone. We wasn’t given the chance to do it on the microphone until we got to turn heel and even like the first six months, we wasn’t talking until we were like asking them and saying ‘we got something to say’. Finally it was our segment to say something after a match and there it went – that happened. And the next week we got a promo. And then the next week we got a promo. And then the next week we got a promo. They liked what we were saying and the way we were saying it, because it’s real, so ‘we’re going to keep doing this’. So it’s funny man, it wasn’t like we were talking about the wrong stuff, we just never got the chance to talk. Your feud with the New Day last year was fantastic. At Fastlane we get to see you go at it again, in what could perhaps become a triple threat, with Chad Gable and Shelton Benjamin. What do you think Gable and Benjamin bring to the table and how excited are you to get to renew this feud with The New Day and freshen it up ahead of WrestleMania? I don’t know man, to me I feel like that’s something you got to ask Shelton and Gable. Ha ha. I know what we’re bringing to the table. These other tag teams have got to bring everything they’ve got to table to get on our level. The New Day, that feud right there – classic. Classic man. There was a rap battle in there and I ain’t never seen a rap battle done that way in the WWE. Yeah I’ve seen John Cena spit a couple of freestyles to Kurt Angle and stuff like that, you remember when he was the Doctor Of Thuganomics? But I ain’t never seen a rap battle like that though. I just thought that was fun man. Shelton and Gable, they are a real technical tag team, but they are new together so they still got a whole lot to learn about each other. But Gable is lucky he has Shelton in his corner, because Shelton was a mentor of mine before I started – he trained me at Booker T’s school [in Houston, Texas]. Gable is in good hands, I can vouch for that. I’m actually anxious to see what happens to Shelton and Gable man because that tag team right there, is the tag team to look out for, definitely. You can watch The Usos in action at WWE FastLane live on Sky Sports Box Office and the WWE Network, on March 11. Tag team wrestling has been brought in from the shadows, according to some of WWE’s top stars. Some of the industry’s biggest tag team names live long in the memory of fans, with the likes of The Legion of Doom, The Nasty Boys, The Hart Foundation, The Hardys and Edge & Christian all very fondly remembered. And the present-day WWE product is enjoying something of a boom in its tag scene after a relative slump. After seeing singles competition dominate screens for much of the late noughties and early 2010s, some of sports entertainment’s best weekly action comes in the form of tag bouts. The Usos and Gallows & Anderson are two teams sitting near the top of the tag team picture, with the latter being former Raw tag team champions and The Usos, as reigning tag champs on Smackdown Live, are regarded as the best team of their generation. As part of a look at the tag genre, The Independent spoke exclusively to Jimmy Uso and Luke Gallows as they looked back at the history of tag teams, their own respective fortunes and what the future holds. Where the present day and the right here, right now is concerned, it’s clear to Uso at least that the these are vibrant, thriving times for the likes of he and his brother as they continue to rule the roost both between the ropes and on the microphone when it comes to entertaining fans. There is, though, plenty more to come. “I feel like tag team wrestling has been in the shadows for a while,” the 32-year-old said. “When my brother and I debuted in WWE, we knew that if we wanted to make a mark here we’d have to run the tag division, and last year we finally had a chance to really open up and come around to us. “It’s on fire and, right now, I still feel like tag team wrestling is growing because there are a lot of teams down in NXT that haven’t come up to the main roster yet, and a lot of teams out there doing their thing in independent wrestling and people who haven’t made their mark here yet or are trying to get here. Gallows clearly concurs on the present state of play, adding: “I think the tag scene is hotter right now than I have probably ever seen it in my entire career and this is my 16th year in the business. “We have some of the best tag teams we’ve ever had in the history of WWE and you can tell that by the quality of the matches as well; I think it is at an all-time high right now. Undoubtedly, tag team wrestling is something of a specialism. 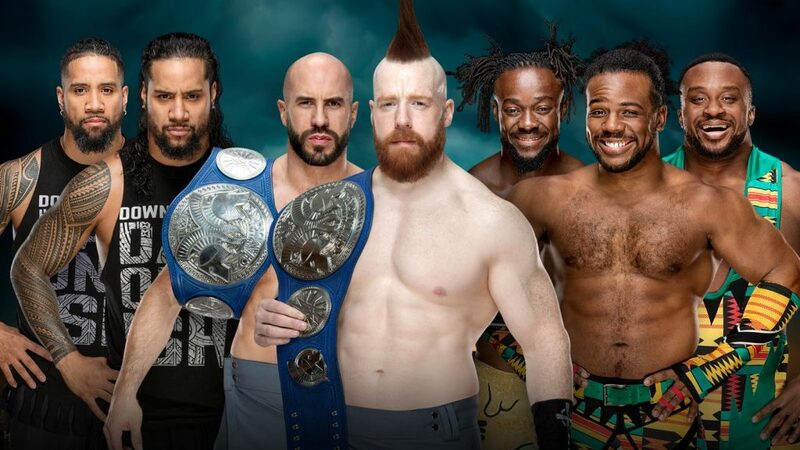 Whereas so much of wrestling’s action pits sole good guy and against lone bad guy, the multi-man format sees teams competing against one another, from two-on-two to all manner of permutations. The Usos were handed Match of the Year in 2017 by Rolling Stone Magazine for one of their many efforts against The New Day – no mean feat when you consider the stunning year had by singles competitors like AJ Styles and The Miz. So, in their eyes, how do the styles compare? Jimmy went on to say: “When I was growing up, the tag division was on fire and I remember watching The Hart Foundation, The LOD, The Headshrinkers – the list goes on. “I knew the tag division was the only way The Usos would ever start to make some noise. “Our feud with The New Day is the best rivalry and the most fun I’ve ever been a part of and it’s really helped people see how much fun tag wrestling can be. Gallows is an accomplished veteran and someone who, uniquely, also has singles experience. He echoed those sentiments by saying: “Tag team wrestling is an art form and it is one of the purest in all of sports entertainment. I really enjoy it and I have spent a lot of my career as a tag team wrestler. The Usos are a rare species in many respects. Graduates of the old FCW developmental territory of WWE, the pair made their main roster debuts some eight years ago. They wrestled much of their early years in the spotlight as the ‘good guys’, or fan favourites. In doing so they became incredibly popular, attaining championships and wining the Tag Team of the Year award on consecutive occasions in 2014 and 2015. It was a little bit of a surprise and something of a risk, then, when on the back of a storyline that saw them paired with polarising Roman Reigns, the decision was made to turn them into heels – antagonist bad guys. 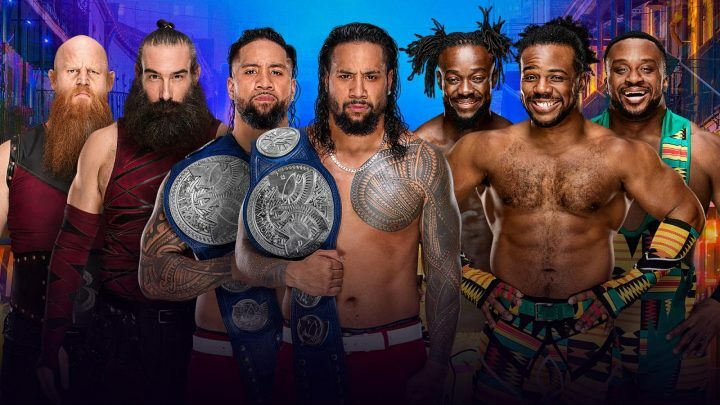 Such a switch and repackaging of characters is usually reserved for those who’ve failed to connect with the audience in any respect or a gimmick that has bombed out – so a far cry from the successful run the Usos had already enjoyed to that point. But the pair have risen to the challenge and blown it out of the water – already eclipsing the accomplishments of their previous incarnation, and even managing to bring the fans back onside whilst doing it thanks to their perpetual performance levels. For Jimmy, it was a case simply of listening to the audience. When asked about the turnaround, he revealed: “I think that was the people’s call – the [fans] called that. “When we said what we wanted to do, we knew we had to deliver and I feel like we did deliver, and the people have got with us, which is cool. Going from something good to something better is hard to do, but while I knew we were climbing, I didn’t know we’d get to where we’re at now. His confidence isn’t without basis. Uso, who is married to fellow WWE superstar and whose father is Hall of Famer Rikishi, a star of the Attitude Era in wrestling from the late 1990s and early 2000s. But while The Usos sit atop of the tag team tree at present and Gallows & Anderson regularly shine on Monday Night Raw, there are a string of tag teams waiting to come and claim the limited spots available to wrestling talent to strut their stuff. As Uso had noted; The Undisputed Era, The Authors of Pain and the Street Profits are just three of the teams in NXT waiting for their call-ups, while the independent circuits are full of untapped talent. Who catches the eye? Jimmy added: “It’s all of them, actually – I remember being down there and just being hungry and trying to get [to the main roster]. The tag teams in NXT are making their mark, doing their thing and getting ready for us. Gallows looks at the topic of the future a little differently. He and Anderson are members of the famed and popular Bullet Club – a clique of wrestlers dotted around the world, including current WWE Champion AJ Styles. Other ‘members’ include Former WWE star Cody Rhodes, currently kicking up an absolute storm in Ring of Honour while the likes of Kenny Omega is one of the biggest names in New Japan. It’s no surprise that 34-year-old Gallows would relish being reunited with some of those names further down the line – stressing you need to succeed in WWE to really lay claim to greatness in the industry. “I’d love to have Leo Tonga and Bad Luck Fale,” he admitted, when pressed on the Bullet Club point. “I’d love to see the Young Bucks come over. The Bullet Club has unbelievable talent all around the world, there’s no denying it. Perhaps fittingly, though, when given our last word to discuss potential future opponents for he and Anderson inside the squared-circle of WWE, Gallows had one name right at the top of his list. 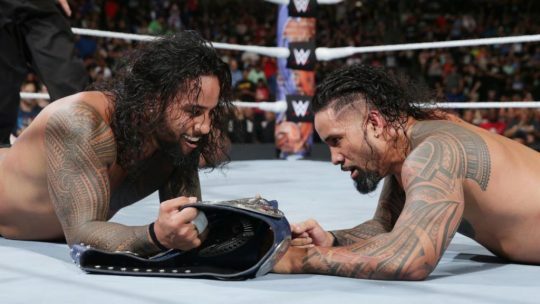 “I’d love to get in the ring with The Usos again,” he admitted. “When we first came to WWE we went right into a feud with them and I thought we had great matches with them. Luke Gallows joins his partner Karl Anderson and The Usos as part of WWE Wrestlemania in April, available on WWE Network, and on a tour of the UK and Europe in May. For full details visit wwe.com. 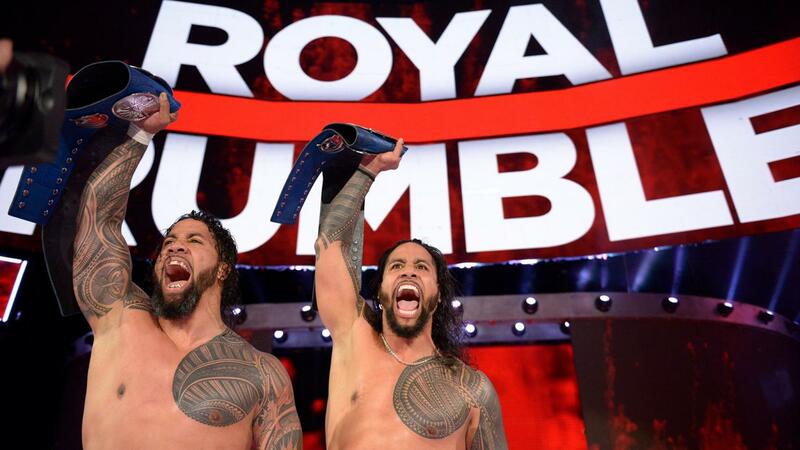 Not more than two years ago, The Usos were the bubbly, energetic cousins of Roman Reigns who painted their faces and tried to get the crowd to chant along with them. However, sometimes the WWE Universe can get tired of certain gimmicks and there’s a clear sign that the refresh button needs to be hit. The Usos couldn’t be a more perfect example of this. In 2016 after being drafted to SmackDown Live in the re-hashing of the brand split, they turned heel and completely re-invented themselves, gaining the admiration of the WWE universe. 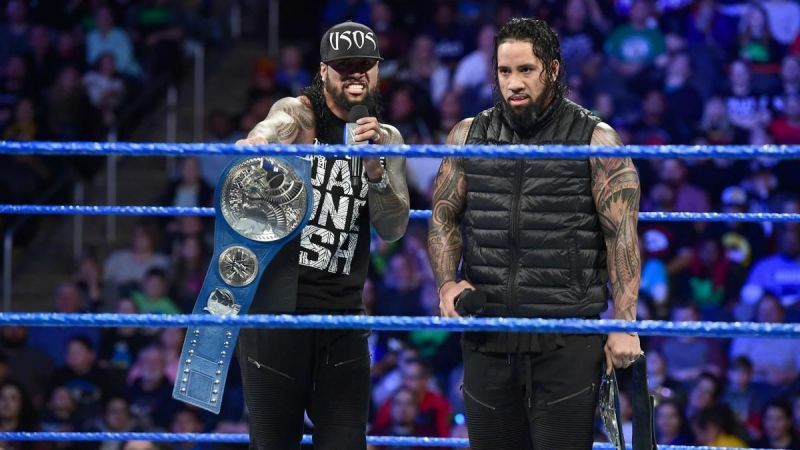 The Usos spent a good portion of 2017 as tag team champions on SmackDown Live, where they clearly established themselves as the top dogs of the division. 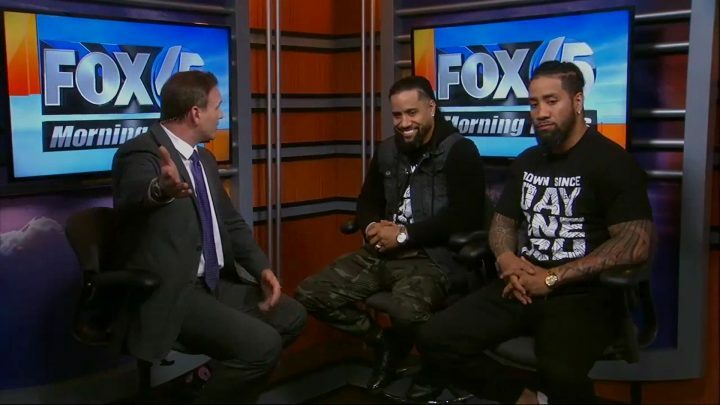 Now babyfaces, The Usos have continued to pick up some steam, and we had the opportunity to speak to Jimmy Uso himself. Sportskeeda: What are your thoughts on the Dudley Boyz entering the Hall Of Fame this year, and what did you learn from your rivalry with them? 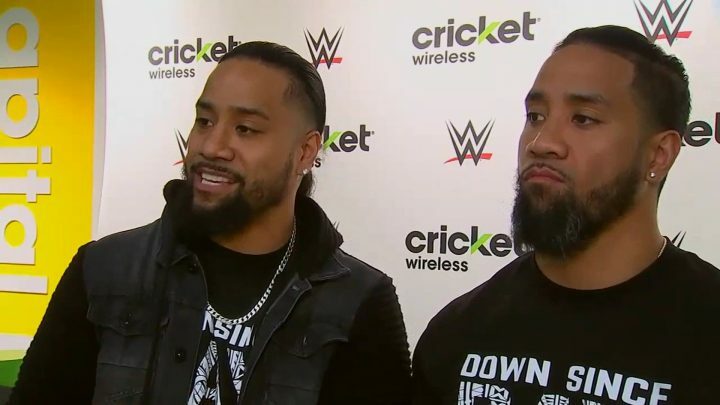 Jimmy Uso: I think the Dudleyz being inducted into the Hall Of Fame is really cool for me because they were one of the tag teams I grew up watching. I remember the feud with the Dudleyz, the Hardyz and Edge & Christian. We were four brothers and we would mimic everything they did. To see them while growing up and to actually be in the ring with them? I learned so much from them. I learned some psychology from them. I thought I knew tag team wrestling but I needed to learn more psychology and I learned it from the veterans. To be in the ring with those guys, it was an honour. It was like being in the ring with the New Age Outlaws. I think it’s awesome, they deserve to be in the Hall Of Fame. Our feud with the Dudleyz was hands down one of the most fun rivalries. A lot of respect for them. Hopefully, they can pass down the 3-D to the Usos. Who knows? Sportskeeda: In 2017, you and Jey Uso managed to up your game and take it to a whole new level. What do you think it was in the SmackDown tag team division that helped you both do so? Jimmy: Like I said, I remember watching the tag team division, with The Hart Foundation, LoD (Legion of Doom), The Headshrinkers, the list goes on. I just knew the tag team division was the spot, the only way The Usos can get the tag division rolling. It’s been on fire. I just feel like we’re the best, we’ve amped it up with The New Day, it’s been awesome. Hands down the most fun rivalry I’ve ever been a part of. There’s been rap battles, street fights, Hell In A Cell, Handicap matches, we did everything. I think it’s helped people see how fun tag team wrestling. My philosophy is this: ‘If there are two guys in the ring, what’s better than two guys? Four guys’. That’s the way we look at it and thought about it, and that’s how we went after it. The tag team division is hotter than it’s ever been. It’s hotter than the RAW tag team division, I can tell you that much. Sportskeeda: Have any of you two ever thought about embarking on a singles career down the road? Or do you plan to stick around as a tag team for the foreseeable future? Jimmy: I don’t know man, never really thought about it. As far as going singles, it really hasn’t crossed my mind, because we have so much more left to do in the tag division. The Usos have so much more to give. People haven’t seen all of us. Another dream match would be me vs my brother at WrestleMania. I grew up watching Bret vs Owen in a cage match, and they beat the living hell out of each other. I thought it was really cool, what they did. And they’ve been doing that all their lives. That’s the same way I see us whenever we get the chance for that to happen. But as far as a singles run right now, we’re just concentrating on the tag division. Jimmy & Jey Uso showed why they are the top tag team on SmackDown LIVE at the Royal Rumble event, pulling off a clean sweep victory over Chad Gable & Shelton Benjamin in a 2-out-of-3 Falls Match to retain their SmackDown Tag Team Titles. 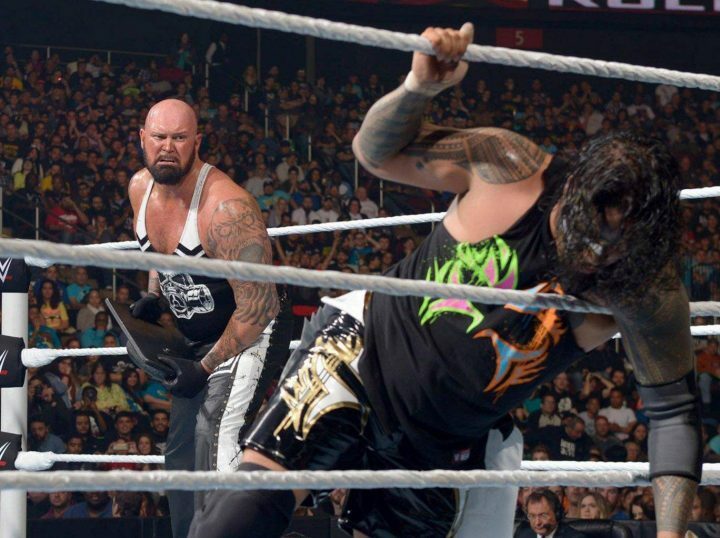 With the mat-wrestling mavens in their rearview mirrors, what is next for The Usos? Will another team step up to enter the Uso Penitentiary?